I was able to slither into E3 this year, thanks to my friends at IndieCade, and, following all of your unconscious mindbeams, I made straight for the Forza Horizon booth. After waiting in a long, sweaty line I was finally able to try it out firsthand, and, even better, talk to the head of the studio about the game. He's the one who told me you'll be able to race a '70s Boss Mustang against a WWII P51 Mustang fighter. Sold. As you've likely heard, Forza Horizon is a huge open world. You're no longer limited to specific tracks or races, you can drive on surfaces other than racetrack tarmac, even off-road. You can drive at night, staring into sunsets, and more. It's sort of what you pictured happening between the race events in Forza 4. Microsoft is calling Forza Horizon an "action racing" game, and that underscores the big conceptual difference between it and Forza 4. Where Forza 4 is more of a racing simulator, this is more of an arcade-ish game. That said, it's still based on the very realistic Forza 4 physics engine and uses an enhanced version of the hyper-real graphics engine, so what you're looking at isn't any less realistic. That's a relief, as it would have been easy to turn the visuals into a caricature for this sort of shift, but they didn't. Well, they did get a lot more exuberant with the typography in the game, but it's fairly well designed and they avoided the trap of turning all the 2D design into something that looks like it would have come out of Ed Hardy's colon. While I'm talking about visual design choices, I have to comment on the booth babes. Yes, they were the usual eye-achingly lovely young women, but for some reason they decided to have them dress in these neo-hippie Pocahontas-headband outfits. They looked fine, but I just don't get what it had to do with a racing game. The horny male geeks that made up 90% of the crowd didn't seem to care, so I guess they know what they're doing. Playing Forza Horizon is both familiar and strange. Those used to Forza 4 will find essentially the same control system, familiar-looking cars and overall feel. But there's some huge differences. The lighting is dramatically more varied, with a low sun in the sky giving everything a striking golden cast, and your cars' lights actually work. The physics are tweaked just a bit, with your car feeling a bit more lively than in Forza 4, a bit more inclined to drama. There's many more objects in the environment, guard rails and signs and fences, and they can all be effectively destroyed by some sloppy driving. And that's fun. There's lots of background music from the Horizon "radio station" and that plus the irritating DJ voice were pretty annoying. Hopefully that can be turned off. There were also virtual people present in the demo reel, a first for Forza. The people were at car shows, milling around, looking at cars, and, in one case of painful accuracy, a virtual girl was texting disinterestedly while her virtual boyfriend was scrutinizing a Mazda. At least that's what it looked like. Jalopnik: So, what's the big difference with Forza Horizon? Alan Hartman: It's a fundamentally different take, it's about music and car culture, the fun and the style of the entire scene. There's different road surface types, not just closed racing circuits— even off road. There's plenty of racing, in the form of challenges and formal races, and even a number of special challenges, like racing a '70s era Boss Mustang against a P51 Mustang. Jalopnik: A P51? As in the WWII fighter plane? AH: And, nighttime! There's so much that happens in the street scene at night, and we wanted to make sure you could drive at night. Jalopnik: Are you still using the Forza 4 physics engine? Has anything changed? AH: It is based on the same physics engine, yes. We did tweak things to allow for more "stylish" driving, though. Jalopnik: What about the visuals? AH: It's based on the Forza 4 engine, again, but with some significant changes. All of the cars had to be rebuilt for Horizon, since they're going to be doing a lot of different stuff. Plus, we had to do things like making the lights work. We're also using a lot more scattered light effects compared to Forza 4, and have many more different lighting environments. Much more bounced light for atmosphere. We have what we've been calling, usually in a British accent, "UberLOD"— LOD meaning "Level of Detail." There's also big vistas you'll see as you drive. Views that go 20 miles out— and you can drive to any of them. Jalopnik: What do you mean? AH: If you see it, you can drive to it. Well, maybe not some of the mountaintops, but still. You can drive into the Rockies, then look down off the side of the mountain and see the festival below. The map is full and huge and there's many miles of road to discover. Jalopnik: Can you import your cars from Forza 4? AH: Not really— they're different cars. Some special ones, yes, we'll have Horizon versions of them, but not all of them. Jalopnik: So, in this big open world, how is everything structured? AH: The basic premise is you're attending a festival, and your goal is to become King of the festival by gathering fans. You do that by winning races, risky driving, stunts, special challenges and events. Jalopnik: It looks like there's now actual humans at these festivals. Much like some actual car shows I've been to. AH: Yes! Interaction with people is there. There's a story and everything, but as always, the car is still the star. Jalopnik: In Forza 4, I love that I can kill 10 minutes waiting for something by quickly jumping in and playing a quick race. Will that sort of easy, casual play still be possible here? AH: Yes— we still want to offer a casual aspect. You can hop right in and start driving, just drive around if you like, or find a challenge for a race. 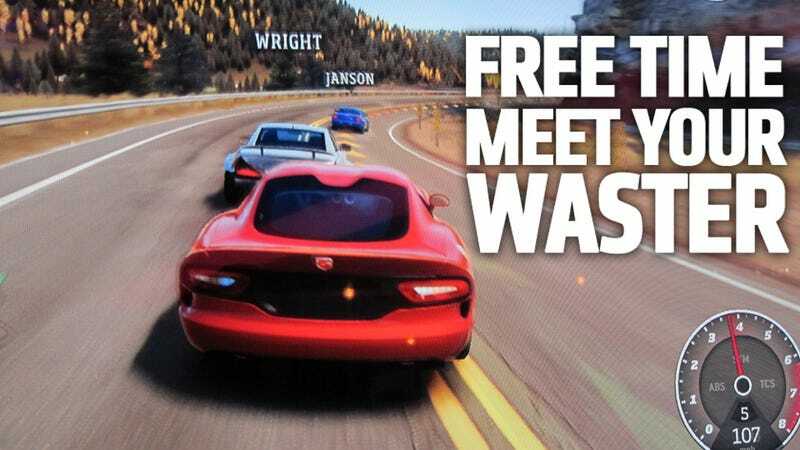 Jalopnik: I banged into a bunch of non-player cars when I tried it out. Most seemed to be Priuses. Are there any repercussions for, you know, vehicular manslaughter of innocents? AH: Uh, nope. In fact, we have a sort of informal minigame seeing how many Priuses you can knock off the road. Don't let Toyota hear that, though. We love Toyota. Jalopnik: Oh, I won't tell them. How many cars will be available? Any nice weird ones? Vintage ones? AH: There's a LOT of cars. I can't give a number now, but it's huge selection. All road cars this time, no pure race cars like in Forza. They're an eclectic mix, cars you'd take to a festival. Jalopnik: Any message you have for Jalopnik readers? AH: Thanks for putting in all those wild cars! Forza Horizon will be released on October 23, and I'm looking forward to it for one specific reason: I've always thought the best part about driving games is giving the player the chance to do the sort of inane, stupid, and dangerous things they'd never do in a car in reality. Forza Horizon looks like a great place to drive like a dangerous idiot.